This inexpensive and succinct booklet provides a straightforward and practical aide to those serving as sponsors or godparents in the Christian Initiation processes in their parish. It is pragmatic, spiritual, down-to-earth, and easy to read. It enables parish RCIA leaders to provide a high-quality means of effectively communicating the Church’s intentions for this crucial ministry of companionship and conversion in the catechumenate. Each section in this beautiful small booklet is preceded by a full-color photograph and a quotation from one of the saints. For example, "What is RCIA?" is preceded by the quotation: "How sweet is the way of love. True, one can fall or commit infidelities, but, knowing how to draw profit from everything, love quickly consumes everything that can be displeasing to Jesus; it leaves nothing but a humble and profound peace in the depths of the heart" (St. Therese of Lisieux, Story of a Soul, Ch. VIII). Unique terms to the RCIA process are given definitions, pithy suggestions worth their weight in gold are solicited, and a Home Retreat coupled with Lectio Divina provide food for the soul. 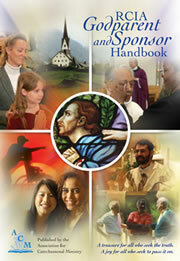 It is recommended to give one of these handbooks to every Godparent/Sponsor within your parish RCIA process. What is a Godparent? What is a Sponsor? What If the Person I'm Serving...?